Chanoyu training of course includes temae (tea procedure) and how to act in the tea room, but a knowledge of tea utensils is also acquired, and it is important to know how to co-ordinate the many utensils. Each utensil has a different function and meaning in the tea room. This difference is behind the concept of 'remote' and 'proximate' utensils in the 'Bunrui Sojinboku'(Encyclopedia of Tea) and the 'rules of utensil use' that have been handed down since the time of Rikyu. This shows how important the concept of 'remoteness and proximity' is. 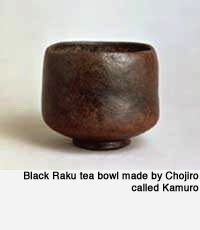 In thick tea procedure the tea container and the tenmoku tea bowl used with a stand are the nearest to the tea and so the most important utensils. The flower container and others are farthest from the tea. This proximity and remoteness is important in the combination of utensils. Also, when selecting utensils there is a big difference in those used in a hiroma (four-and-a-half mat room or larger) and those used in a koma (less than four-and-a-half mats, for example, three mat or two mat rooms). The utensils used in koma, also called soan ('thatched hut') tea rooms are wabi utensils of quiet taste which have a unique kind of beauty. Wabi utensils are not beautiful enough to stand on their own, and their beauty only becomes apparent when they are combined with a number of other utensils which are mutually supportive in terms of colour and shape. Many wabi utensils have a monotonous and quiet colouration which makes it difficult to call them beautiful. To feel beauty when looking at a utensil that would not normally be called beautiful, this is the beauty of wabi. In the hearts of people looking at the utensils, there is a special place where a deeper beauty can be seen in something that has no colour, or that is lacking in tones. This kind of Zen thinking (the positive way of thinking that a deficiency does not mean that something is unsatisfactory, but is precisely what helps to move the spirit), was already sought by the people who came to the tea room (the host and guests). In order to understand this kind of beauty, a specific kind of spiritual training was necessary for tea devotees.